Someday soon, you might wake up to the call to prayer from a muezzin. Europeans already are. And liberals will still tell you that "diversity is our strength"--while Talibanic enforcers cruise Greenwich Village burning books and barber shops, the Supreme Court decides sharia law doesn't violate the "separation of church and state," and the Hollywood Left decides to give up on gay rights in favor of the much safer charms of polygamy. If you think this can't happen, you haven't been paying attention, as the hilarious, provocative, and brilliant Mark Steyn--the most popular conservative columnist in the English-speaking world--shows to devastating effect. The future, as Steyn shows, belongs to the fecund and the confident. And the Islamists are both, while the West is looking ever more like the ruins of a civilization. But America can survive, prosper, and defend its freedom only if it continues to believe in itself, in the sturdier virtues of self-reliance (not government), in the centrality of family, and in the conviction that our country really is the world's last best hope. 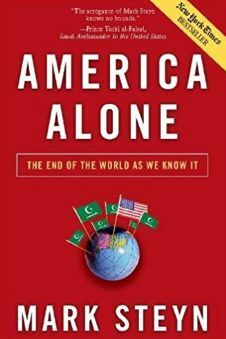 Mark Steyn's America Alone is laugh-out-loud funny--but it will also change the way you look at the world.